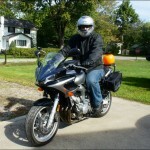 Now that Winter is in full force in Northeast Ohio, I have started some cold-weather mods for my 2004 Yamaha FZ6. I’ve completed some maintenance basic work, including changing the oil, flushing the coolant, and switching out the spark plugs. One of the first mods is the addition of a TAPP USB Power Port from 3BR Powersports. This cable connects into the motorcycle’s charging system to provide a powered USB outlet that I can use to charge my smartphone or power my GPS unit. The port has a weather-protected seal that will prevent rain-damage, and I have a compatible USB cable for my Garmin Nuvi that forms a water-tight seal with the port. 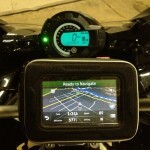 To hold the GPS, I added a Givi S950, which connects to my handlebars, giving me an easy to access view of both the GPS and my instrument panel. The bag is weather-proof, but the plastic window still allows the touch screen to be used, even if it can be clumsy sometimes. One of the features I didn’t like about the FZ6 is that Yamaha built it so that only one of the lights will be on when in “low-beam” mode. Both lights only come on when switched over to “high-beam”. This has caused a number of people to tell me that one of my lights had burnt out. 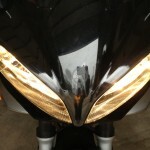 I rewired the headlights using Motogiro’s headlight mod kit. Now I have both lights, and the road is much brighter for it. Finally, I installed Killernoodle’s clutch slave mod. This updated clutch slave lever helps with the FZ6’s “binary” clutch, giving it a much larger and smoother friction zone. I can’t wait for the Spring weather to come so that I can try out all of these updates!